The modern kitchen is more than just a place to serve delicious meals, it has evolved into a space for entertaining, and doing other family tasks. Because it has become a multi-functional room, its décor should reflect this as well the connection to adjacent rooms in open floor plans. About 59% of kitchen updates are changed to be more open and to include other rooms. The kitchen has become the main place for entertaining and technology has also had a huge impact in kitchen design. Let’s look at the top design and cabinetry trends for 2019. One mistake that commonly happens is the lack of storage do to penny-pinching on cabinets and organization. Homeowners want wide drawers, base trash pull outs, roll out trays, pantries, cutlery organizers, and blind corner solutions. They’re looking for enhanced access for hard to reach areas, and increased functionality. The average home is about 2,000 square feet, but small home renovations and construction still happen frequently. Homeowners are looking to retain antique charm while mixing clean lines and simple styling for their smaller homes. Modern cottage pairs whites, off-whites, and light toned paints with colours and slight embellishments. Homeowners usually prefer simple and clean styling over ornate details. This is because a minimalistic style caters better to busier lives. This style is referred to as modern or contemporary. Doors, glass, and tile are utilizing the X motif because of its flexibility as an accent. It’s a natural graphic element that can adapt to many design styles from farmhouse to modern. 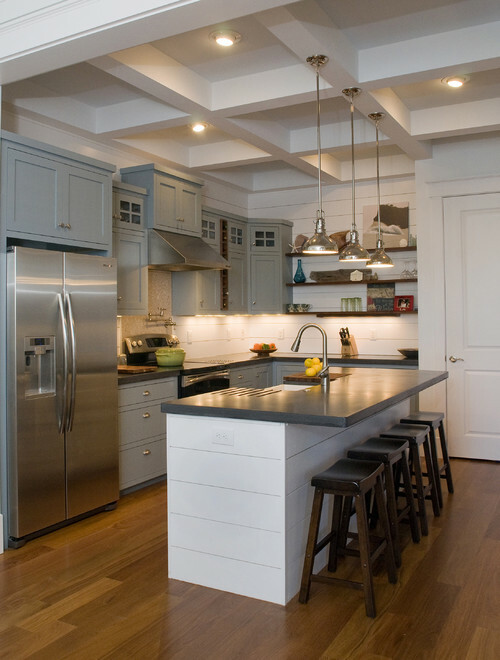 For those who seek clean looking cabinetry, tailored shiplap caters to that. It carries the eye through the space with its texture, it offers clean lines, and it can also be mimicked with planking. This is achieved by using finishes with multi-tonal characteristics — for example, the luster of metals combined with organic elements in the kitchen. Dimensional finishes offer clean lines, movement and texture. Designers have noticed that many homeowners leaned toward mixing opaque finishes and stains in 2018. This trend has the very good potential for cabinetry design because it offers more flexibility, it gives more choices should homeowners choose to change anything in the future. Defined or rustic woods are made from woods such as walnut, oak, cherry, ash and elm. Their heavy graining is a great feature that brings in depth. This trend celebrates imperfection. It calls for an organic colour palette that complements opaque tones. Pale woods with dry finishes are a characteristic of this trend. White is still a primary choice for finishes, however, dark tones are being added to create a balance with the white kitchen design. Walnut or deep finishes on cherry and oak are most commonly used for this trend. This trend involves wood stains that appear to change based on wood species, lighting in the room, and what’s placed next to them. Chameleon colours offer a balance between warm and cool tones. 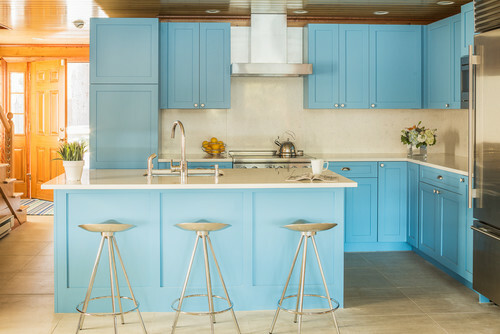 Neutrals still serve as the baseline for kitchen design, but personalized colour is making a comeback. People are looking to express themselves in their spaces by way of colour choice. There is an increase in the use of laminates in kitchens because of the realistic textures that modern laminate applications can offer. Some laminates boast an authentic wood look and very realistic stone surfaces. According to research by The Fredonia Group, increased cabinets and furniture demand will continue to drive the growth of decorative laminates in the United States by 2.5% annually. At Hardwood Creations our dedicated team of designers can help you to make these kinds to decisions when it comes to designing your cabinets. We will guide you through every step of the process, so your personalized cabinets express your individual personality. When it comes to cabinets we are the experts, so come see us and we will fulfill all your cabinet design needs.